Thanks for your update(s) solartim. it is possible for crevasses to initiate at depths of 10–30m. From December 2006 to January 2007, hot-water drilling on Pine Island Glacier, West Antarctica, was found to trigger crevasses. Yes it calved again. Sentinel 1 images, medium resolution (EW=40m/pix scaled to 80m/pix). Fast. Next crack will react to this calving in this year? This image shows that for the time being, the PIIS no longer buttresses the SW Tributary Ice Shelf. Thanks Wipneus. Great job, good anmation. I wonder about the structures left above "2018". Is that ice mélange or smaller areas of almost open water between the ice? I also wonder about the SW tributary. Is there an acceleration detectable? a. The 'structures left above "2018"' is ice fractured in shear where the PIIS slides past (& bears against) land. This is not an ice mélange, but rather is fractured ice with small areas of 'open' water temporarily exposed to freezing. Title: "Antarctic Peninsula Ice Shelves"
The PIIS is surely in record retreat territory. I am hoping for a long-term animation or graphic showing the current calving front against the past few years of PIIS advance and calving activity. There appears to be a rise just south of the Southwest Tributary that the PIG slides past, noted by its circular gray appearance. Is there a name for this rise? Is there land beneath it? It appears to provide buttressing for the PIG and may prevent further retreat of the glacier. Are these the same features visible on last image and gif? Thanks for your opinion and for the link to various smaller and larger ice shelves around the Peninsula. Title: "Huge Antarctic iceberg breaks off Pine Island Glacier"
Extract: "An iceberg about five times the size of Manhattan has broken off the Pine Island Glacier in West Antarctica over the past 24 hours, an ominous sign of the continued retreat of this fast-flowing mass of ice. Like many other marine terminating glaciers in Antarctica, this glacier is retreating over time, and increasing the movement of ice into the sea." Turns out Stef Lhermitte has posted such an animation going back to 1973. The retreat is indeed into record territory, and especially so at the important junction of the SW tributary and the PIIS. Edit: this is the same animation appearing in ASLR's link above. "In early 2000 large PIG calving events happened every ~5 yrs (2001, 2007, 2011), but since 2013 there were 4 of them (2013, 2015, 2017, 2018). Consequently, the glacier front retreated strongly from the 1972-2013 range and it is now ~5km further inland than in 2015-2017"
further acceleration of flow and thus further dynamic thinning. The triangular feature is Evans Knoll. Has calving now gone past Evans Knoll such that further calving can be expected? Or will the glaciers just accelerate so the calving front advances to stabilisation points of Evans Knoll and the SW tributary? "We do not expect further significant rapid calving line retreat in the next few years." O dear. The paper was published this year. I suppose it depends on what they mean by "significant." "The newly discovered rift R3 (inset of Fig. 5) will likely trigger the next calving event." open access. it is a nice paper, my quibbles notwithstanding. do read all about it. bathymetry is revealing. Breaking up is not so hard to do. Just finished reading the Arndt paper. Very well written and explains quite a lot about the behavior of the calving front over the last few years, including that grounded rotating iceberg that spent more than a year in the bay. I strongly recommend reading to anyone interested in this thread. The disturbing part is the realization that the current stabilization mechanism (besides Evans Knoll) is the point of contact with the SW tributary glacier, which has just been lost or seriously weakened. Bad times for the PIG and West Antarctica in general. "the current stabilization mechanism (besides Evans Knoll) is the point of contact with the SW tributary glacier, which has just been lost or seriously weakened." is to wonder what happens. I imagine that both PIG and SW tributary advance more rapidly until Evans Knoll and SW tributary again provide stabilisation pressures. This advancement further thins the glaciers so that might make PIG more prone to calving in response to pressure from SW tributary. OTOH the Arndt paper suggests the rift that recently calved was induced by (intermittent) back pressure from the grounding point that is no longer playing a part. It is not at all clear to me whether Evans Knoll will play that same role nor, if it does, whether more or less effectively. That is no more than wild speculation by me. Anyway, any comments or further or different speculation welcome. 1. The first two images that show that such conditions tend to advect more warm circumpolar deep water, CDW, beneath the Pine Island Ice Shelf, PIIS. 2. The third image shows that such warm CDW beneath the PIIS tends to increase the rate of melting of the PIIS basal ice. 3. The fourth image panels A & C shows typical (ENSO neutral) water circulation (in 2009) beneath the PIIS and panels B & D show typical water circulation during La Nina conditions (with reduced CDW circulation). Thus in the next year we should see enhanced basal ice melting, and enhance thinning, for the PIIS. 1. As a minor point the first images shows that Evans Knoll sits on a peninsula and the PIIS actually contacts the peninsula rather than Evans Knoll itself. More importantly, the second image shows that shear rifting occurs (if the PIIS ever returns to this area) downstream of the peninsula, while local compress in the PIIS prevents shear rifting upstream of the peninsula. 2. The third image shows that as the PIIS thins (due both to ice volume conservation and basal ice melting) the grounding line retreats, thus allowing and subsequently calved icebergs to more easily float over potential pinning points. 3. The fourth image shows a typical computer simulations that shows stresses in the PIIS that are largely induced by flexure as the water elevation changes due to such factors as: tides, storm surge, and stagnation pressures due to advection of warm CDW. All of these considerations can accelerate fracturing of the PIIS along zones of pre-existing weaknesses. 1. The first image shows that currently the ice velocities PIIS are faster than those for the SW Tributary Glacier/Ice-Shelf, thus one might suspect that the buttressing action of the PIIS on the SW Tributary Glacier may restored in a few years; however, I note that on the left side of the PIIS there are extensive shear rifting (or marginal crevasses as shown in the second image) immediately upstream of the SW Tributary Glacier, and that such fractured ice many not buttress the SW Tributary Glacier as well as in previous years. 2. The third image shows the local bathymetry so that readers can better appreciate where the ice flow movement is occurring. 3. The fourth image from MacGregor et al shows a close-up of the old ice velocities in the SW Tributary Glacier; which now are likely accelerating due to the loss of buttressing from the PIIS. This is largely background information to get readers oriented, and to reduce idle speculations. 1. The first image shows a cartoon of the conceptual transition of a marine glacier with an ice shelf to one with an ice cliff calving face. Further, I note that DeConto & Pollard have estimated that before GMSTA reaches 2.7C that hydrofracturing will cause the PIIS to collapse leaving the PIG with an ice cliff calving face. 2. The second image shows a rendering of postulated paleo ice cliff failure calving of the PIG when it extending into the Pine Island Bay. This shows how the calved icebergs can float over the top of potential subsea pinning points. 3. The third image shows Durand et al's estimate of the profile of the PIG/PIIS in 2014, showing that the seafloor is relatively flat upstream of the current grounding line. This means that if the Earth warms enough for hydrofracturing to occur for the PIIS then the PIG may calve icebergs associated with over a hundred kilometers of grounding line retreat before stabilizing. 4. The fourth image shows a graph illustrating the relationship of ice cliff calving (in kilometers of retreat per year) versus both ice cliff freeboard and relative water depth. Collectively, these images indicate that before GMSTA reaches 2.7C, the PIG ice face could retreat rapidly within a couple of decades. In a study published today in Nature Communications, researchers led by Imperial College London have connected a huge 130-km-long channel (the distance between London and Birmingham) on the surface of an Antarctic floating ice shelf to the landscape two kilometres below the ice sheet upstream. The channel, and associated features on the ice surface, are thought to be a point of instability on the ice shelf. If the surface ice melts, water will preferentially run down these features, carving out a deeper channel and creating further weaknesses. Ice-shelf surface channels are seen across Antarctica, so the process uncovered in the research is likely to be commonplace. Now the cause has been identified, researchers can investigate similar channels for signs of instability elsewhere in Antarctica, especially in regions known to be vulnerable to change. The Foundation Ice Stream is also the type of glacier that can have water at its base, flowing between the bottom of the glacier and the underlying rock. The team found that when the base of the glacier encountered a large solitary hill at the same point it starts to float,a gap emerged under the ice downstream of the hill. This gap was filled by water from around the base of the glacier, which carved a gouge upwards into the ice. This gouge was 800 metres high in some places, and led to the extensive channel seen on the surface of the ice. Satellite imagery reveals flowstripes on Foundation Ice Stream parallel to ice flow, and meandering features on the ice-shelf that cross-cut ice flow and are thought to be formed by water exiting a well-organised subglacial system. Here, ice-penetrating radar data show flow-parallel hard-bed landforms beneath the grounded ice, and channels incised upwards into the ice shelf beneath meandering surface channels. As the ice transitions to flotation, the ice shelf incorporates a corrugation resulting from the landforms. Radar reveals the presence of subglacial water alongside the landforms, indicating a well-organised drainage system in which water exits the ice sheet as a point source, mixes with cavity water and incises upwards into a corrugation peak, accentuating the corrugation downstream. 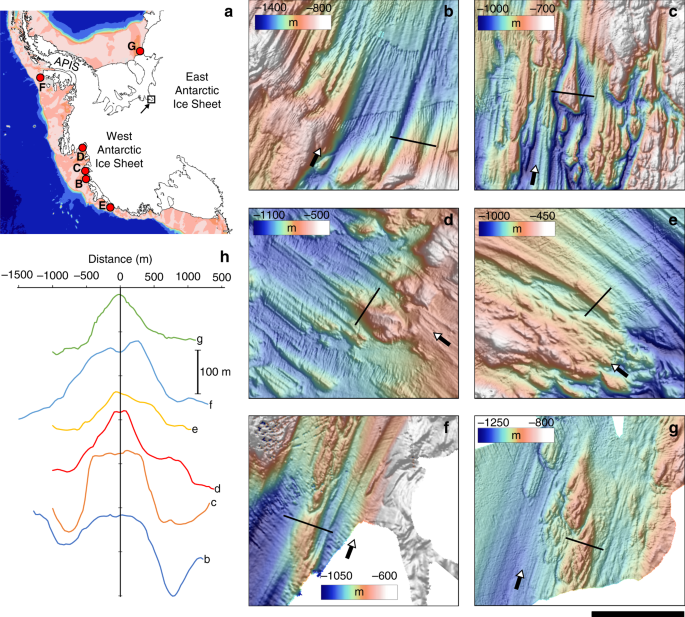 Hard-bedded landforms influence both subglacial hydrology and ice-shelf structure and, as they are known to be widespread on formerly glaciated terrain, their influence on the ice-sheet-shelf transition could be more widespread than thought previously. In the way of more background, the following 2013 reference makes it clear that both calving rates and basal ice melting rates are high for the PIIS (PI in the images); in part due to the frequent advection of warm CDW. The linked reference better quantifies the ice mass loss from both calving and basal melting for the major Antarctic ice shelves. The first attached image shows: Calving fluxes (green) and basal mass loss (−BMB; red). Pie chart shows numbers for surveyed ice shelves only. Errors, 1 s.d. b, Ratio between calving flux (green) and BMB (red), in per cent of total flux. The second attached figure shows a significant correlation (R2 = 0.84 (coefficient of determination); P = 3.13 × 10−5; F-test) between surface lowering rates8 and our mean basal mass-loss rates (−SBMB) for thinning ice shelves. Abstract: "Iceberg calving has been assumed to be the dominant cause of mass loss for the Antarctic ice sheet, with previous estimates of the calving flux exceeding 2,000 gigatonnes per year. More recently, the importance of melting by the ocean has been demonstrated close to the grounding line and near the calving front. So far, however, no study has reliably quantified the calving flux and the basal mass balance (the balance between accretion and ablation at the ice-shelf base) for the whole of Antarctica. The distribution of fresh water in the Southern Ocean and its partitioning between the liquid and solid phases is therefore poorly constrained. Here we estimate the mass balance components for all ice shelves in Antarctica, using satellite measurements of calving flux and grounding-line flux, modelled ice-shelf snow accumulation rates and a regional scaling that accounts for unsurveyed areas. We obtain a total calving flux of 1,321 ± 144 gigatonnes per year and a total basal mass balance of −1,454 ± 174 gigatonnes per year. This means that about half of the ice-sheet surface mass gain is lost through oceanic erosion before reaching the ice front, and the calving flux is about 34 per cent less than previous estimates derived from iceberg tracking. In addition, the fraction of mass loss due to basal processes varies from about 10 to 90 per cent between ice shelves. We find a significant positive correlation between basal mass loss and surface elevation change for ice shelves experiencing surface lowering8 and enhanced discharge9. We suggest that basal mass loss is a valuable metric for predicting future ice-shelf vulnerability to oceanic forcing." Thanks for the explanations, figures and information. 1. The first image shows the relationship between the SW Tributary Glacier and the Thwaites Glacier's eastern shear margin. 2. The second image shows the measured profiles of salinity and temperatures above freezing for the PIIS. 3. The fourth information shows a computer projection of representative CDW flow patterns in the ASE and beneath the PIIS. 4. The fourth image shows Plastic Necking for Antarctica's four biggest ice shelves, which illustrates how warm CDW beneath an ice shelf can burn up through basal crevasses in the bottom of the ice shelf. The latest calving event made it into the scientific news in the show "Forschung aktuell" of "Deutschlandfunk", a nation-wide public information radio station. I imagine that both PIG and SW tributary advance more rapidly until Evans Knoll and SW tributary again provide stabilisation pressures. 1. As the PIIS ice flow velocity is faster than that for the SWTIS, the attached Sentinel image from Nov 5, 2018, indicates to me that it is likely that as the PIIS advances it will continuously peel-off the Northeast corner of the SWTIS, as I see a new crack (marginal crevasse/fissure/rift) there that I did not see a week ago. If so, the PIIS may not provide buttressing action to the SWTIS anytime soon. 2. To me the pressure recently exerted by the SWTIS on the PIIS is the most significant factor that cause the splitting tension stress that caused the recent major calving event for the PIIS. Thus I would not say the SWTIS provides 'stabilization pressure' on the PIIS. Landsat delivered a cloud-free image of the PIG and the recent calving, now officially named B-46 (as long as it does not disintegrates into small pieces ). The image is attached at 60m/pix. The arrow points at a linear feature, that may be the next big crack. This is shown in detail, resized to 7.5m/pix and contrast enhanced. A cloud-free Sentinel 2 image would be very nice now. The attached Nullschool weather image shows MSLP and surface wind patterns for Nov 8 2018. This image shows that (likely due to the current El Nino condition) the Amundsen Sea Low, ASL, is positioned so as to direct surface winds directly into the Amundsen Sea Embayment, ASE; which tends to induce upwelling of relatively warm circumpolar deep water, CDW, into the ASE; which then accelerates basal ice melting of both the sea ice and floating ice shelves, therein. If such conditions continue for several months this will promote ice loss from both the PIIS and the SWTIS (not to mention also the Thwaites Ice Shelf). New NASA Icebridge photos and video of the PIG. Video is on Facebook so not sure if everyone can access it. The NASA comparative image in the previous post (image Nov. 7, 2018) clearly shows a number of "cracks" appearing across PIG above the latest break? Nat Geo website had an article with some NASA photos today. Given the fractured, rubble like nature of the ice to the right of the glacier, I would not be surprised if there were another significant calving this melt season. There appears to be very little pinning there and, if it does calve, I would expect this glacier to also rotate away from this side as the current glacier has done. On that 3rd image, what are the yellow and red lines? Is the red line the current grounding line? That image is fig 2a (showing PIG) of the following paywalled reference, and the attached image is fig 2b for Thwaites. As I am too cheap to purchase this paper, the images come from sidd, but these images make it clear that the red line shows the local grounding line and the yellow line shows some short of time averaged (from 2009 to 2014) position for the ice face of the associated ice shelves (note the dotted yellow line across the active calving front for the Pine Island Ice Shelf, PIIS, indicating that this ice face was actively shifting during the 2009 to 2014 period). Abstract: "We employ airborne gravity data from NASA's Operation IceBridge collected in 2009–2014 to infer the bathymetry of sub–ice shelf cavities in front of Pine Island, Thwaites, Smith, and Kohler glaciers, West Antarctica. We use a three‐dimensional inversion constrained by multibeam echo sounding data offshore and bed topography from a mass conservation reconstruction on land. The seamless bed elevation data refine details of the Pine Island sub–ice shelf cavity, a slightly thinner cavity beneath Thwaites, and previously unknown deep (>1200 m) channels beneath the Crosson and Dotson ice shelves that shallow (500 m and 750 m, respectively) near the ice shelf fronts. These sub–ice shelf channels define the natural pathways for warm, circumpolar deep water to reach the glacier grounding lines, melt the ice shelves from below, and constrain the pattern of past and future glacial retreat." every 400 m. Profiles A-A’ to F-F’ in orange with dots every 10 km are shown in Figure 3. Would you mind to combine this photograph with the one you posted on Reply #767 on: September 21, 2018, 09:11:33 AM? Is this the same crack or a new one? Also, for those not familiar with the recent history of if the ice shelves in the ASE, I provide the attached image from MacGregor et al. (2012).